Erzullie Fierce Plus Size Fashion Philippines: PLUS SIZE OPINION: DO WE HAVE THE RIGHT TO BE OFFENDED WHEN WE ARE GREETED WITH HOW BIG WE HAVE BECOME? PLUS SIZE OPINION: DO WE HAVE THE RIGHT TO BE OFFENDED WHEN WE ARE GREETED WITH HOW BIG WE HAVE BECOME? It's almost a common occurrence for us plus size women. Specifically, those who used to be thin and then gained some weight for some reason. Whenever we see a relative that we have not seen for a long time or even someone who is not even that close to us, more often than not, (maybe it's a cultural thing) you will be greeted with "Wow, (insert your name)! You are so fat now!" If they even want to rub it in, they will try to even touch your belly or any place in your body that actually has gained weight. They would even start painting scenarios of your old body and how much your body has grown exponentially. One would think that this would not offend a plus size (self-love) advocate, knowing that there is nothing wrong with being fat, but once in a while, to be greeted with that line, irks us. One has to wonder --- why? 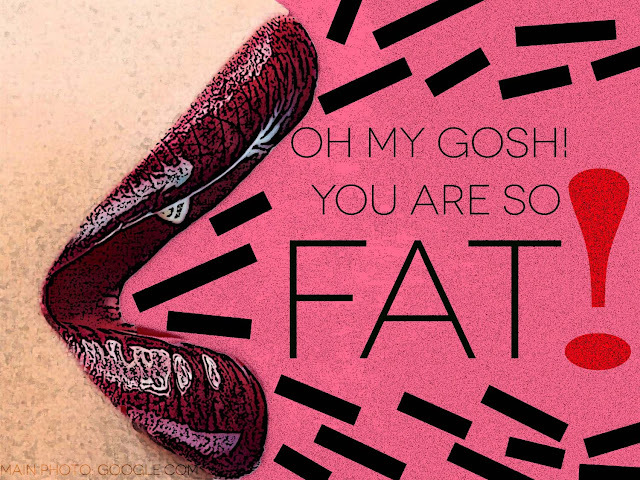 Is it because it is still culturally ingrained in us that fat equals ugly? Is it because we (to those who can connect) do not believe deep inside that fat is a good word? If so, are we (plus size advocates) a hypocrite for the love your body movement? I have actually had some encounters like that. There was a neighbor of ours, whom I have not met for years and I am not even close to her, approached me in public (during a village gathering) touched my belly and even pinched me, telling me in a loud tone, "Grabe, Aries! Ang taba taba mo na!." (Oh my, Aries, you are so fat already!) And I looked at her and it's not like she has the body of Shamcey Supsup or Venus Raj. In fact, she was almost as big as me. My reply? I touched her belly as well and I went with the same tone as hers, "Naku, Tita! Ikaw din! Ang taba, taba mo na! Grabe! Dati, ang payat mo. Ngayon grabe, ang taba mo na!" (Oh my Auntie! You too! You are sooo fat! Super! You were so thin back then but now you are so fat!) I also went on to touch her belly and pinched it softly. I actually saw the look on her face. She was terrified. She concealed her belly, grabbed her daughter and raced off my sight. SCORE ONE for defensive Aries. That's the point --- I was defensive. I was defensive because I felt offended. Was I offended because she called me fat? I mean as a plus size advocate, fat is not a bad word, but in this case, do I really, fully believe it? After some reflection, I have realized that I felt offended not because she called me fat (because it is true, I am). What pushed my button was that she was making me feel ashamed of my body for being fat. What she did to me is --- BODY SHAMING. "Body Shaming" is defined as so... "... playing on someone's body image and ... criticising them for the way they look, and carry themselves, ..." (Indiatimes.com) Basically, it's making people feel bad for how they look just cause. With this, I have realized that I was offended because she was shaming me for having a body bigger than my past one in front of my other neighbors. I can still forgive her for just calling me out on how much I have grown, because I have grown. However, she was just too eager to keep on pointing it out by TOUCHING MY BODY and showing it to the other neighbors how much my body is overflowing (as it seems)! Although she did not directly call me ugly for being fat, words, when the tone is changed, can feel differently to the receiver. She should have been sensitive enough (or more understanding) that greeting me in that way will make me feel like an anomaly of society. With her loud tone, she was attracting attention of our other neighbors who don't even know that I was there. Furthermore, touching someone's body is a very personal thing. (Although it may differ culturally) She should have at least asked permission before touching it or even just threw that idea out all together because this is my body. This is my temple. Only I can tell who gets to touch it. So why would we be offended when we are greeted with "you are so fat now"? Simple. We feel that we are being shamed for our current body shape right now. It's not because we think that fat is a bad word. It's not a hypocrisy. It's more of the feeling that it's trying to impart. We feel shamed. How about you? Whenever you are greeted by someone "Wow (insert name)! You are so fat now! ", would you be offended? If so, how would you go about it?